The most popular service we offer is our couples massage. We have a variety of options for you to choose from. 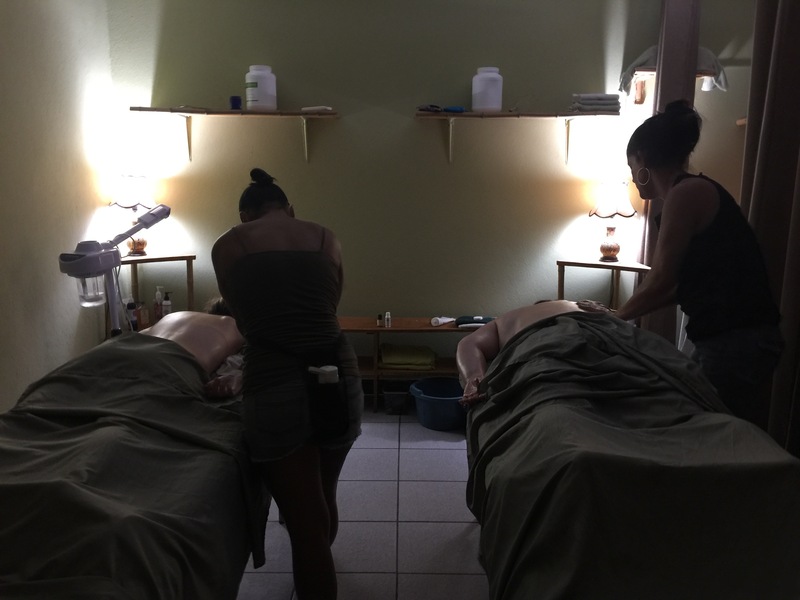 Hot Stones, Deep Tissue, Hot Oil, and nurturing relaxing massages are available. All products, creams, essential oils etc... are organic. Our staff have been working with us for four years. They are the best in town. Please visit Massage Menu Page and book your appointment here on our website. Anti Aging Facials, Micro Dermabrasion, Facial Toning, or a nurturing hydrating Facial are available with our expert skin care specialist. Enjoy our organic skin care products such as an Avocado/Cacoa Mask, or Rose Oil Hydrating mask. 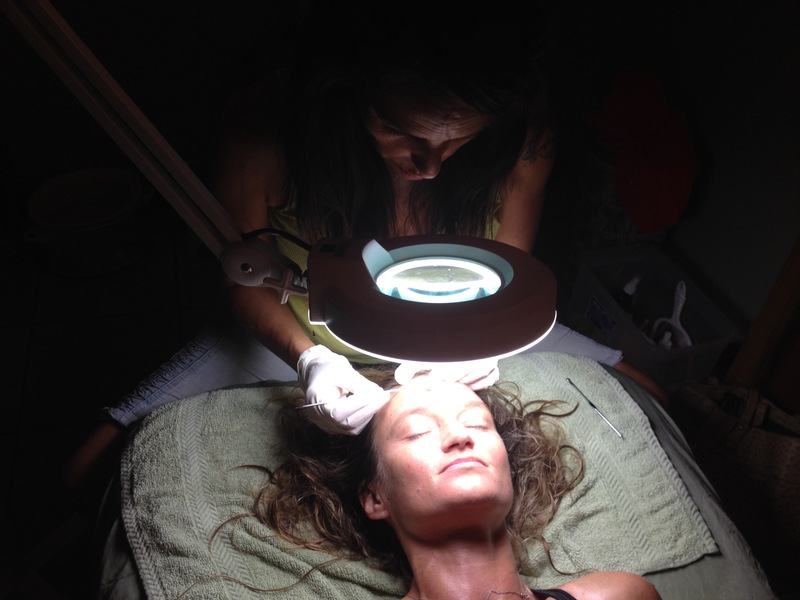 All Facials include 20 minute upper body and face massage. Please visit our Facial Menu Page to see what interests you and then book your appointment today. This season we are adding Gel Nails to our nail menu. Manicure Pedicure treatments include an organic scrub and massage. As for organic nail polish, we are still working on adding an organic option. We haven't done this yet. Because of the beach lifestyle we decided to use products that endure the rough athletic conditions of the jungle beach. We are known for our Organic Sugar Full Body Waxing. Men and Women are both welcome. Full Brazilian, bikini, legs, back, chest, mustache, eyebrows and more.... are available. This technique and Sugar product is not as painful as most other honey or plastic treatments. Please visit the waxing menu page, pick service you would like and book your appointment here on our site. ALL OF OUR HEALERS AND SKIN CARE EXPERTS HAVE BEEN WORKING WITH THIS COMPANY FOR FOUR YEARS. THEY ARE THE BEST THAT THIS TOWN HAS TO OFFER. YOU ARE WELCOME TO COME AND ENJOY YOUR TREATMENT IN OUR SPA OR WE CAN TRAVEL TO YOU. WE HAVE FIVE EXPERT STAFF MEMBERS WHICH MAKES IT EASY FOR YOU TO FIND AN APPOINTMENT TIME THAT WORKS AROUND YOUR VACATION SCHEDULE. WE TAKE PRIDE IN BRINGING TO YOU A WORLD CLASS MASSAGE, FACIAL, BODY SCRUB, MANICURE PEDICURE, AND FULL BODY WAXING EXPERIENCE.